So, Zack Wilson thought, almost laughing at himself. I’ve been at Camp Wolf Trail, what? Ten minutes? And already I’m having an adventure. At last! Being at Camp Wolf Trail is a dream come true for city boy Zack. Finally, he’ll have the summer full of wilderness backpacking, rock climbing, canoeing, whitewater rafting, friendship, and fun of which he’s always dreamed. But nature has surprises in store for Zack: animals, weather, and even the earth itself don’t behave the way he expects, and especially not the way his favorite book, The Outdoor Adventure Guide, has described them. After Zack makes a mistake that nearly costs him the friendship and trust of his cabinmates, he loses confidence in himself. When a scary catastrophe strikes, and Zack is faced with life-threatening danger, will he have the courage and problem-solving smarts to lead his friends to safety? 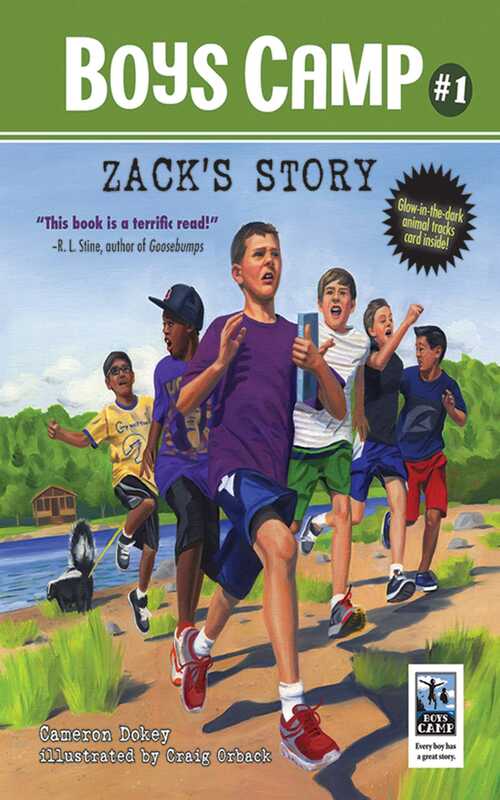 With humor, honesty, and a deep appreciation of boys and wilderness, author Cameron Dokey and illustrator Craig Orback capture readers’ curiosity in this rollicking first Boys Camp story of adventure and bravery, Zack’s Story. This paperback edition also boasts an animal tracks ID card, perfect for outdoor exploration!